November 2011 Archives - Newman Dignan & Sheerar, Inc. - Providence Fee-Based Financial Advisors November 2011 Archives - Newman Dignan & Sheerar, Inc. The European debt crisis continues to drive volatility in global markets. Last week U.S. equity markets were off around 3% as fear of contagion spread to Italy and Spain. Yesterday markets rebounded as the retail sales reports for Black Friday indicated that U.S. consumers were still spending. Also over the weekend European leaders were promising plans to establish fiscal controls for European economies. Volatility will likely continue until Europe comes up with a credible plan to pay down debt. Recently the OECD (Organization for Economic Cooperation and Development) said that “the global economic outlook has deteriorated significantly.” They expect the euro zone economy to contract at a 1% annual rate in the 4th quarter of 2011 and by 0.4% in the 1st quarter of 2012. Any large negative event in Europe would likely trigger a global recession. The major economic news this week will be the monthly jobs report on Friday. Look for job growth of 125,000 and unemployment rate of 9%. Job growth is still not fast enough to reduce the unemployment rate. avoid it. Of course with the continued dominance of Europe’s debt debacle, it’s no wonder U.S. treasuries are bought and global stocks are sold. Add a bit of flavor from the U.S. Stupor Committee [they’re not really “super”, are they?] and once again we are left with more uncertainty than before. We are not thankful for our political leaders’ lack of leadership both here and abroad. 2011 is winding down quickly and we are not ruling out the potential for a â€œSanta Claus Rally.â€ The holidays are a very busy time of year; however, we recommend taking a moment to review your personal financial situation for 2012 and beyond. The market advanced four of the last five days, with the DJIA up 1.4% and the S&P up 0.8%. Jobless claims were slightly less than expected, the trade deficit and government budget deficit were also smaller than expected, while CSCO, BBY and GM all beat earnings expectations. This positive weekly result masked a violent midweek air pocket as markets dropped 3.6% Wednesday, declining as contagion fears spread to Italy from Ireland and Greece [among others]. The IPO calendar, a measure of market psychology, is filling. Angie’s List, Delphi Automotive, InvenSense [motion detection] and Manning & Napier are among the ~9 firms slated to come public this week [up from 5 last week]. This week’s economic data include: PPI, Retail sales, CPI, industrial production, housing starts and Leading Indicators. Addendum: Core retail sales [released 11/15] were up a better-than-expected 0.6% in October, boosted by an unsustainable 3.7% increase in electronics and appliances [the iPhone 4s?]. 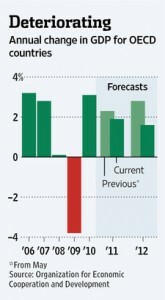 As a result, the outlook for 4Q GDP is improving to ~3% or more, from earlier fears of only 2.25% growth. The monthly employment report was released on Friday and it provided some unusual glimmers of encouragement through the revisions made to the prior two months. October saw only 80,000 new jobs, but the revisions for August and September were up 102,000. The backbone of our economy continues to be the small business. Most of the growth in October was small and medium size businesses. While large companies continue to out source and send jobs offshore, the small business person plugs along adding jobs to the system. It is shocking that large companies now only employ 17.5 million workers domestically. We certainly need to encourage the smaller companies with positive incentives. Meanwhile back in Europe we have a new government coming to Greece and a new national head about to be announced. It would seem the changes will help Greece to receive the package they need. In Italy interest rates have been soaring to levels feared to be deleterious to the country. While Italy may have to seek a bailout, it is not yet clear how Europe could handle a problem of this magnitude. Stay tuned as the soap opera called Europe plays out.